This, therefore, is my attempt to guide you toward the quintessential dishes of Florence. I am, obviously, leaving out a million amazing things to eat in Florence. The wild boar (known as cinghiale in Italian) that roam the Tuscan hills? That gets turned into one of the richest pasta sauces you’ll ever taste. Crostini di fegatini? A delicious and traditional start any Tuscan meal. And gelato? You don’t need me to remind you how much I love gelato, right? Sure, I’m leaving plenty of deliciousness out, but eating in Italy is like sightseeing in Italy – you can’t do it all in one trip. With this list of three things you must try in Florence, at least you’ll be well on your way to having three memorable culinary moments during your stay in the Tuscan capital. Learn more about so-called “Italian food” as well as what to do in Florence while you’re at it, too. If there’s one Florentine dish that needs virtually no introduction, it’s the bistecca alla fiorentina. There are specifics about cattle breeds and cooking instructions that are required in order for a hunk of meat to be a true bistecca alla fiorentina, but it’s also famous for its size. The grilling of meat is a very, very old cooking method, and found all over the world. Grilling beef steaks has probably been going on in the region we now know as Tuscany for thousands of years – but the name bistecca alla fiorentina doesn’t enter the local lexicon until the 16th century. Some English travelers in Florence joined a wedding feast and, the story goes, called for more “beef steak” when they wanted seconds. The name got Italianized to “bistecca” and it stuck. (Some historians say it wasn’t until the early 19th century, though it remains an adaptation of an English phrase.) 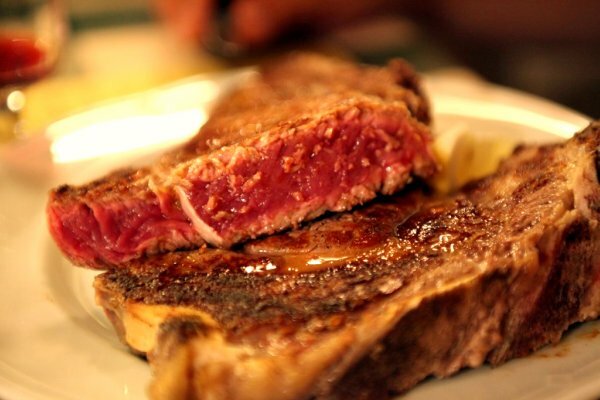 Today, bistecca alla fiorentina is ubiquitous on menus around the city. A true bistecca comes from only one breed of cattle – the Tuscan Chianina, which are large and mostly white. (Some include another Tuscan breed, the Maremmana, as another approved source.) The cut is known as a T-bone in English, which comes from the loin of a young animal, and one steak typically weighs 2-3 pounds. They’re thick – usually described as “two fingers” or “three fingers” thick, which translates to roughly 1.5-2 inches. This Fred Flintstone-sized steak goes straight onto the grill with no seasoning, and it’s cooked for only about five minutes per side. A bistecca will get a sprinkling of good salt and olive oil only after it’s come off the grill. It’s served rare – there is no other alternative – with that gorgeous crusty exterior from the fire. And yes, one bistecca alla fiorentina will serve a few people. Grab some friends and share one with a side of white beans. I know, it sounds like a lot of food, but – hey – you probably earned it earlier with all those stairs at the Uffizi Gallery or Giotto’s Bell Tower, right? Bread is bread is bread, right? Not even close. I mean, if you’ve tasted a baguette in Paris you know it’s better than the ones at your local Safeway. But in Tuscany, the bread is different in a unique and (some might say) unappealing way. Typical bread doesn’t taste “salty,” per se, so you might not realize how much a pinch of salt in bread dough will impact the flavor of the finished product. But it’s a huge difference. The first time you absent-mindedly grab a piece of bread at a dinner table and nibble on it while you’re chatting, you’ll be so taken aback you’ll stop hearing what your table mates are saying. (Or was that just me?) I’m still not one to eat it sans toppings, but having learned the history of – and uses for – Tuscan bread have given me a much greater respect for this simple staple. One story tells of a blockade of the Arno River by Pisa’s army, preventing a salt shipment from reaching their arch-enemies in Florence. Another claims that it was simply the high cost of salt that led frugal Florentines to omit it from their bread. Whatever the reasons, we know Florentines have been making their signature salt-free bread, pane toscano, for hundreds of years. On its own, pane toscano is – I suspect – an acquired taste, or one with which you need to grow up in order to appreciate. I am, as I said, not a huge fan. But I absolutely adore what locals do with that bread in other quintessentially Florentine dishes. Bread without salt doesn’t have any effect on the flavor of a dish, leaving the rest of the ingredients to shine – with the rich, textural base provided by (usually) stale bread. Panzanella is a typical summertime salad of chunks of day-old pane toscano mixed with fresh tomatoes, cucumbers (and sometimes onions) with basil, olive oil, and vinegar. Pappa al pomodoro (also known as pappa col pomodoro) is a simple tomato soup, but it thickens beautifully with pane toscano cooked into it. 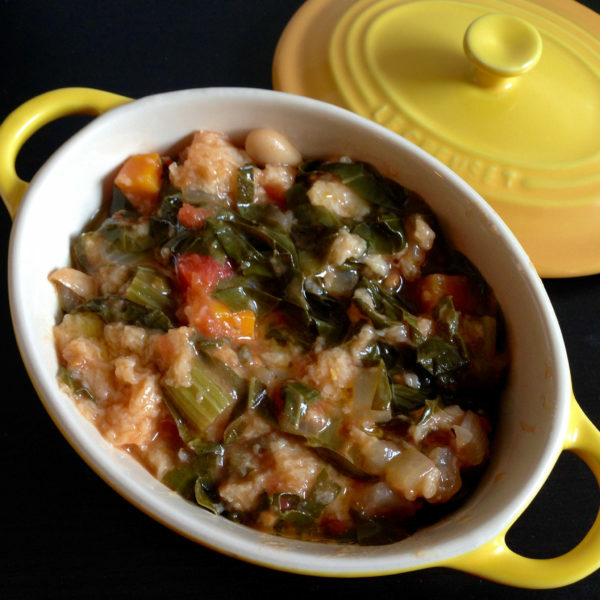 And ribollita (my favorite) is a glorious rib-sticking winter stew of white beans, cavolo nero or dark kale, and pane toscano mixed with whatever other veggies you’d like to throw in and topped with a drizzle of really good olive oil. Sure, these dishes may seem like they have stand-alone brilliance. And they do. But they would be nothing without the salt-free foundation of pane toscano. Those of you who read the first “Must-Eat Italy” article on what to eat in Rome are going to think I’m a bit of a broken record here, but it’s true – much of what we now think of as popular dishes in Italy started out as cucina povera, or “peasant cooking.” Lampredotto, made from a cow’s stomach, is a perfect example of that. Cows, you may remember form high school biology, have four stomachs. 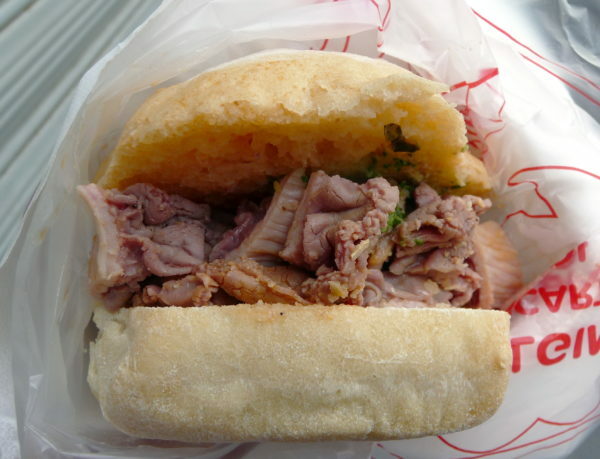 The fourth becomes lampredotto when stewed in a seasoned broth. When it’s then chopped up, piled into the middle of a bread roll, and topped with salsa verde, that’s a panino di lampredotto – Florence’s ultimate street food. You’ll find lampredotto kiosks all over Florence. My friend Judy swears by the one just outside the Mercato Centrale on the corner of Via Sant’Antonino & Via dell’Ariento, but there are plenty to choose from. And while eating offal may not be what you’re used to, I encourage you to give it a try. The flavorful broth and salsa verde alone make a panino di lampredotto worth tasting (the roll can be dipped in the gorgeous broth upon request), and the lampredotto itself is unexpectedly delicious (and has fewer calories than a chicken breast, apparently!). As I noted in the Rome article, the modern popularity of cucina povera is all well and good, but the fact of the matter is that if you’re a carnivore then the environmentally responsible thing to do is to eat every part of an animal. Panino di lampredotto is an historic Florentine food, it’s popular peasant cooking, and it’s a more environmentally responsible way of eating meat. Oh, and it’s delicious. What’s not to love? Tell me, what three things would be on your must-eat list in Florence? What three things are you most excited about tasting when you go to Florence? Only three? I’d just like to mention that I really enjoyed eating farro when in Tuscany, in addition to everything else. Fried zucchini blossoms at Il Porcospino next to San Lorenzo church; risotto primavera at La Sosta delle Contesse at Via Faenza 73; latte dolce gelato at Antica Gelateria at via Faenza 2a are all among my favorites. Can’t wait til September whe I’ll be back there!